MP3 Sticky Player Wordpress Plugin is a powerful and extremely customizable responsive mp3 / audio / video / youtube player for wordpress that can be added at the top or bottom of the page, that can be installed in any type of web page, it runs on all major browsers and mobile devices like iPhone, iPad, IOS, Android, Windows mobile or desktop. 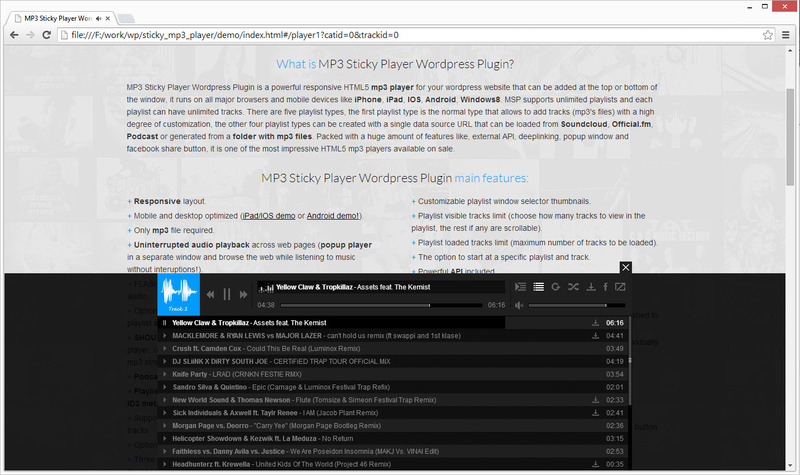 MP3 Sticky Player Wordpress Plugin supports unlimited playlists and each playlist can have unlimited tracks, also it can play mp4 videos and youtube videos. The playlists can be loaded from a simple HTML markup, XML file, mp3 / mp4 folder, Podcasts, Official.fm, Youtube, SoundCloud and PLS (playlist audio file) playlist. Packed with huge amount of features like, extensive external API, HTTP Live Streaming / HLS / m3u8 audio support, deeplinking, popup window, multiple share buttons, customizable skin, Shoutcast and Icecast support, Youtube and mp4 / HTML5 video support, custom post types support, it is the most impressive and complete audio / mp3 / mp4 / youtube player available on sale. Google analytics support, the possibility to view how many times a track was played or downloaded, please watch this video tutorial for more info. Optional custom playlists / categories combo-box selector / select drop-down box. Load any type of playlist through XML, HTML markup, mp3 / mp4 folder, Podcasts, Official.fm, Youtube or SoundCloud, PLS (playlist audio file). Playlist from folderSHOUTCAST & ICECAST support. Play your favorite online radio directly in the player, of course shoutcast playlists can be created with ease! (only mp3 stream supported) Example of a shoutcast play at this link. ong>, create playlists from folders with .mp3 / mp4 files plus ID3 metadata detection. Optional support for mp4 videos and youtube videos with optional fullscreen button. The HTML markup playlists can be created manulay or generated from a database. Logic to allow only a logged in user to play / view the video. Support for playlists with mixed content from different sources (Youtube, Soundcloud or self hosted, local or streaming mp3 adio and mp4 video files. Support sources from Google Drive, Amazon S3 and prety much all services and servers that allows access to a mp3 stream. Optional playlist item download and buy mp3 buttons (this buttons can be removed / added globally or individually for each track). HTTP Live Streaming / HLS / m3u8 audio support on all browsers mobile and desktop, example of a HLS / m3u8 audio file play at this link. Optional start at random track. Optional keyboard support (LEFT/RIGHT ARROWS:skip video 5 seconds forward or backward, UP/DOWN ARROWS: volume up or volume down, M:mute/unmute, SPACE:play/pause). Optional randomize / shuffle playlist, this feature allows to start with a random / shuffled playlist every time the page is visited. Optional playback rate / speed button and playback rate / speed control window. Optional start at a specified playback rate / speed. Possibility to start or stop a track at a specified time. Support for encrypted track (audio / video) paths, for example the path content/videos/fwd-720p.mp3 will be encrypted to encrypt:70de891f83b42a958770b738fd3b66f2 this way it will be impossible to steal the track by crawling the page source. Private password protected tracks, example here. Test password is Melinda. Only mp3 file required to play audio across all devices. HEX / CSS color support, the buttons colors can be modified with simple CSS by passing a hexadecimal color(ex: #FF0000) and even more, we have done it in a cool way that all graphics will retain the texture and at the same time apply the chosen color, example here. Optional search bar and sort buttons. The possibility to add tracks in the playlist at runtime using the API. Share button and share window with multiple social media sharing websites (optional). Added support for loading / generating a playlist from a folder with mp4 files, mp3 files and also mixed mp3 and mp4 files. Added google analytics support, the possibility to view how many times a track was played or downloaded, please watch this video tutorial for more info. Added support for loading shoutcast and icecast servers based on the server URL, as well the option to load and show the current playing song title and song image / thumbnail artwork. Added the logic to allow only a logged in user to play the current track. Added optional search box for the categories / playlists window grid. Added support for Shoutcast and Icecast direct requests to Server via JSONP / fast and automatic update this way MSP will display the current song title played on your radio station. Added support for encrypted track (audio / video) paths, for example the path content/videos/fwd-720p.mp3 will be encrypted to encrypt:70de891f83b42a958770b738fd3b66f2 this way it will be impossible to steal the track by crawling the page source. Added optional randomize / shuffle playlist, this feature allows to start with a random / shuffled playlist every time the page is visited. Added option to position the player at the left side, center side or right side of the screen. Added optional playback rate / speed button and playback rate / speed control window. Added optional start at a specified playback rate / speed. Improved popup feature, MSP will not instantiate in the page from which the popup feature was used until the popup player window is closed. Added two new methods in the API setPlaybackRate and scrubbAtTime. Added the option to start playing a track after the playlist has loaded and autoplay is not enabled. Updated documentation (added section about how to get a mp3 / mp4 source from google drive, more API methods, etc). 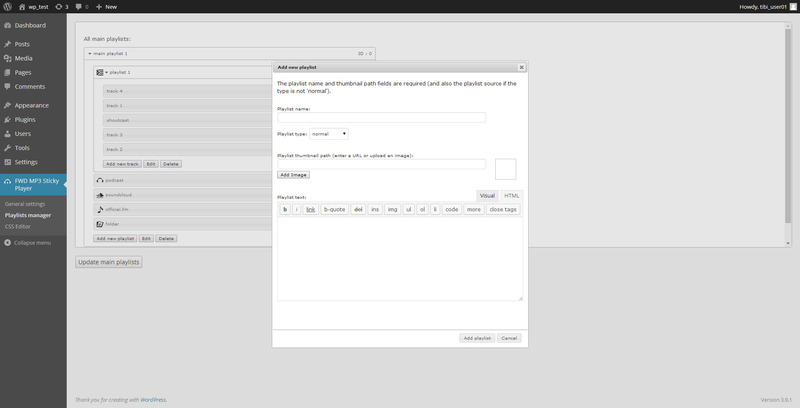 Added Optional custom playlists / categories combo-box selector / select drop-down box. Added the SoundCloud API KEY in the constructor this way it is easy to replace it with a new one. Added support for PLS (Audio playlist). Added HTTP Live Streaming / HLS / m3u8 audio support on all browsers mobile and desktop. On the browsers that dosen’t have native HLS support adobe flash player is used. Added the option to start at a random track after the playlist load. HEX / CSS color support, the buttons colors can be modified with simple CSS by passing a hexadecimal color(ex:#FF0000) and even more, we have done it in a cool way that all graphics will retain the texture and at the same time apply the chosen color, example here. Added optional fullscreen button for the youtube and mp4 videos. Added support for Youtube, now MSP can load Youtube playlists or single Youtube videos. 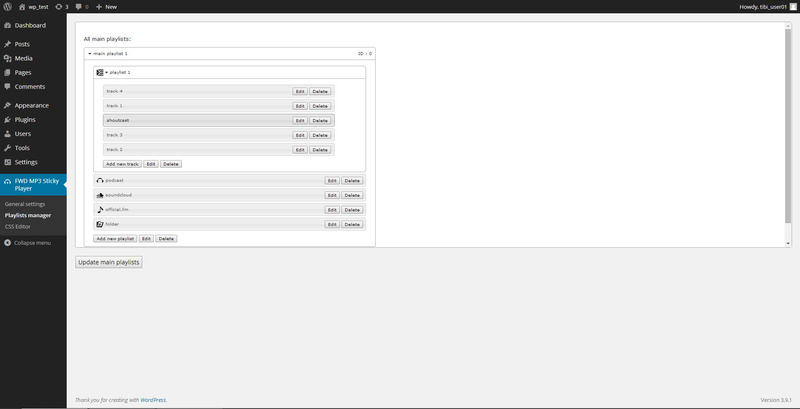 Added support for loading Soundcloud tracks. Added support for mixed playlists, now is easy to create playlists that contains Youtube or / and Soundcloud or / and self hosted or streaming mp3 files. Added optional support to disable the main scrubbar. Fixed volume bar on mobile devices. Fixed bug that prevented to hide the small opener button. Fixed bug that added a fake yellow background for the classic skins. Optimized the admin pannel for the latest Wordpress version. Fixed a Soundcloud download issue. Fixed a small issue with the thumbnail of the “Search bar settings” tab. Added optional counting numbers to each track (track ordering). Added optional playlist search bar. Added optional playlist sort buttons. Added the option to hide the player opener, this way the player can’t be hidden.